Early last spring I was working for a talented woodworker in a quaint little wood shop in Nashville, Tennessee. He showed me a strip built canoe, something I’d never seen before. The wheels in my head started turning. I was completely captivated. Schippers completes work on the oarlock of his John R. Clark designed Classic Dinghy. The stripped dinghy hull before glassing still looks pretty good in a raw state. The plans called for 1/4″ western cedar strips. 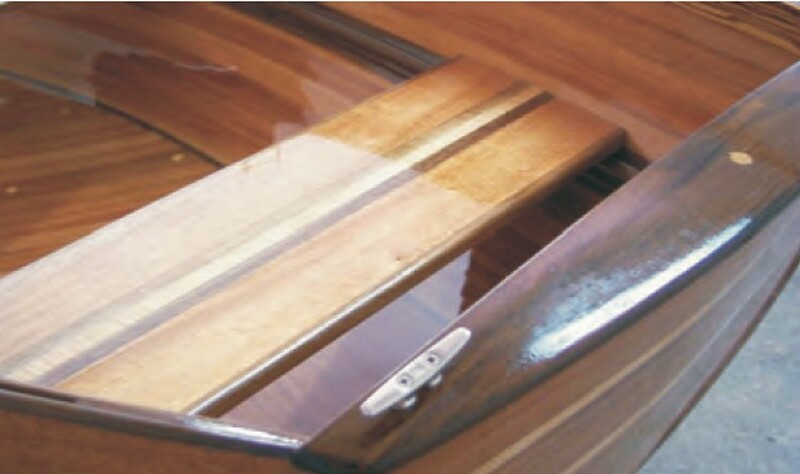 I selected African mahogany with accents of Tennessee walnut and a little bit of maple in the hull, and used zebra wood for the gunwales and cocobolo for oarlock pads. 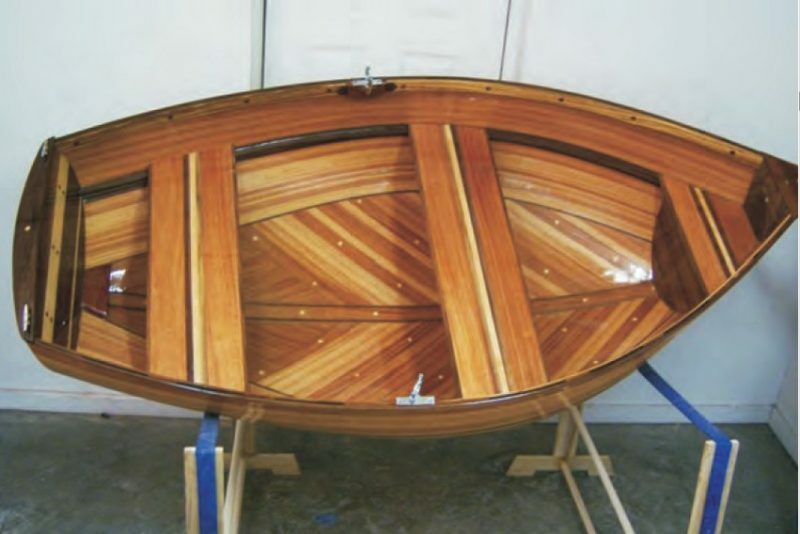 I used two layers of lightweight fiberglass glass and WEST SYSTEM® 105 Epoxy Resin® with 207 Special Clear Hardener™ to seal my wooden treasure.A good friend and I bought John R. Clark’s plans for an 8′ Classic Dinghy. I rented a shop space, loaded in appropriate tools, purchased the wood and started ripping strips only 30 days after seeing my first wooden boat. This was my first time ever using epoxy on this scale to “wet out” fiberglass. I was amazed at how easy, yet strong, this boat ended up being. Building this boat was a lesson in just how much I have yet to learn. I can hardly wait to get started on my next boatbuilding project. 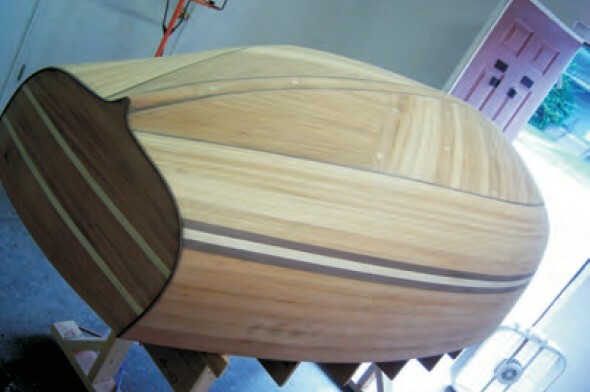 Sean is currently working out of his wood shop in Nashville, Tennessee, and is about to start his second boat build. Bottom detail showing African mahogany with accents of Tennessee walnut and maple. A detail of the transom. 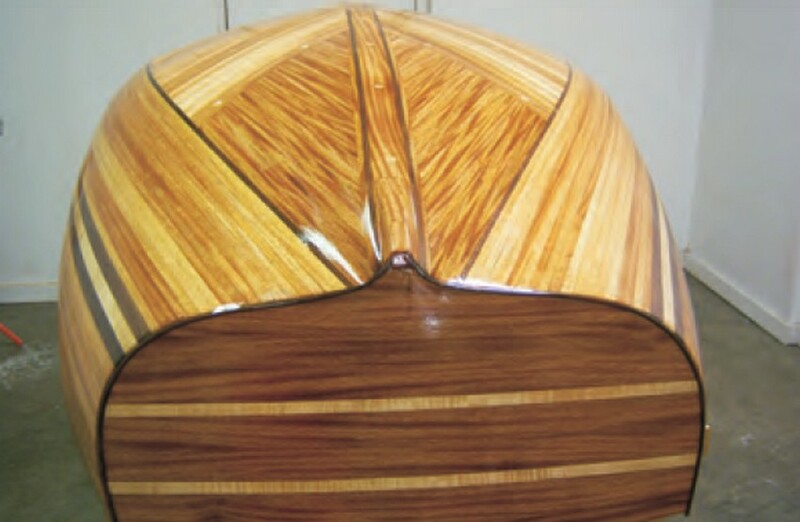 This entry was posted in Boat Construction, Wooden Boat Construction and tagged 207 Special Clear Hardener, 32, African Mahogany, Epoxyworks #32, mahogany, Sean Schippers, Spring 2011, Tennessee walnut, walnut on May 20, 2015 by ewadmin.